This product was previewed for release in 2012 and is the first item produced by Habanos S.A. for their new Habanos Specialist Series. The San Cristobal de la Habana Torreon Jar has been produced in 2000 pieces. 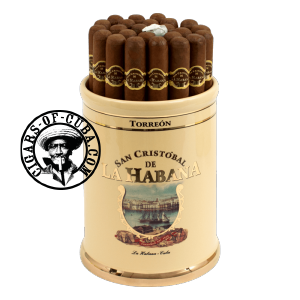 The Jar is ceramic and shows off the San Cristobal de la Habana logo. The jar comes with its own ashtray. The cigar is a new shape, the Torreon (54 x 150 mm) which will suit the rich San Cristobal blend. Each jar contains 25 cigars and is numbered.